I read somewhere that the Delta IV CBC has a borderline SSTO performance too. It's pretty questionable that it would work at all as noted above. If it could, it might just conceivably be a fairly cheap way of orbiting small satellites. But it seems like taking a sledgehammer to crack a nut. I think that would be a waste of a still valuable asset. You're right, it is rampant speculation and a bit OT. Technically it could function in the sounding rocket and suborbital tourism role, but the level of demand is dubious at this time. Jim's suggestion makes most sense to me. Using the rocket equation and numbers from http://www.spacelaunchreport.com/falcon9.html I calculate that Stage 1 alone is capable of somewhere between 7.6 and 8.4 km/sec delta-V depending on the Isp actually achieved. That does not include any payload. The low number uses sea level Isp and the high number uses vacuum Isp so the actual result would be somewhere in between. Its a little chancy to assume that S1 alone could achieve orbit, but of course it could go very high. Hmm, would this first stage need all 9 engines to take off? What if some of them were replace with the Merlin 1D vac? So you take off with one set of engines, then switch to the other, once you have reached altitude. Also, I dont think you would even need all 9 engines. That could save some weight. Certainly not quite as straight forward anymore though and probably completely useless beyond the fun math exercise. 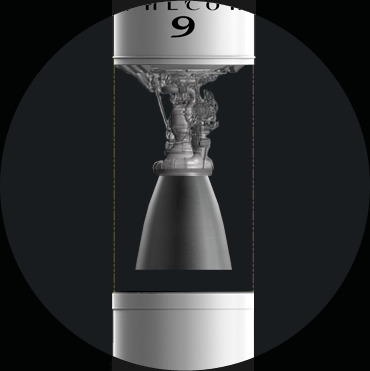 The M1D-Vac nozzle is far too large to fit with any other engine on a F9 diameter vehicle. Using the numbers you linked to and Jeff Greasons rule for average Isp (1/3 * (Isp(SL) +2 * Isp(vac)) needs a mass ratio of about 16:1 but that structure has a mass ratio of 13:1. That suggests there is margin to absorb losses, and a fairing and carry a payload. Naturally going with the new Merlin 1d's improves things quite a bit. However the joker is that the stage could run out of fuel. It just might not be big enough, and one that was would be too heavy.